Mercedes' most extreme GLC model has finally arrived: it’s called the Mercedes-AMG GLC 63 SUV and it’s here to terrify your 2.4 children. The new bahn-storming GLC is on sale now, priced from a smidge under £69,000. Like almost every current AMG car besides the A 45 and CLA 45, the new GLC 63 is powered by the evergreen and frankly brilliant 4.0-litre biturbo V8. 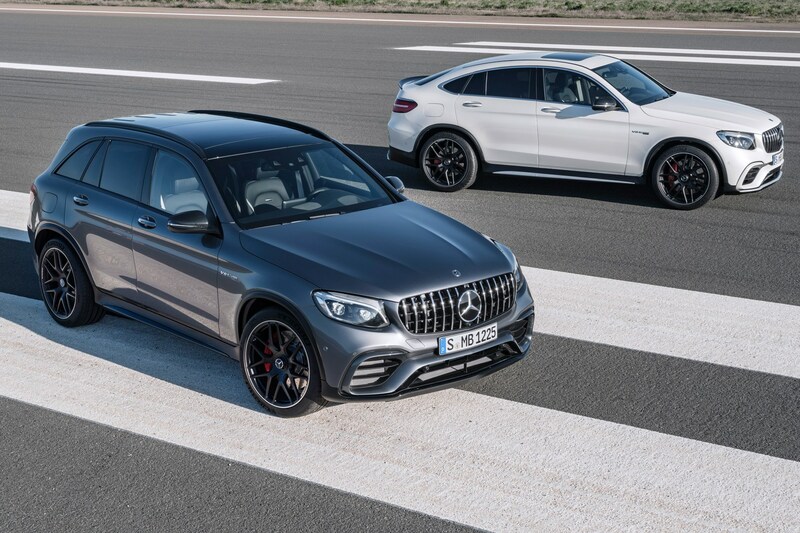 There are two versions available: the standard GLC 63 has 469bhp, while the S version gets an extra kick with 503bhp. 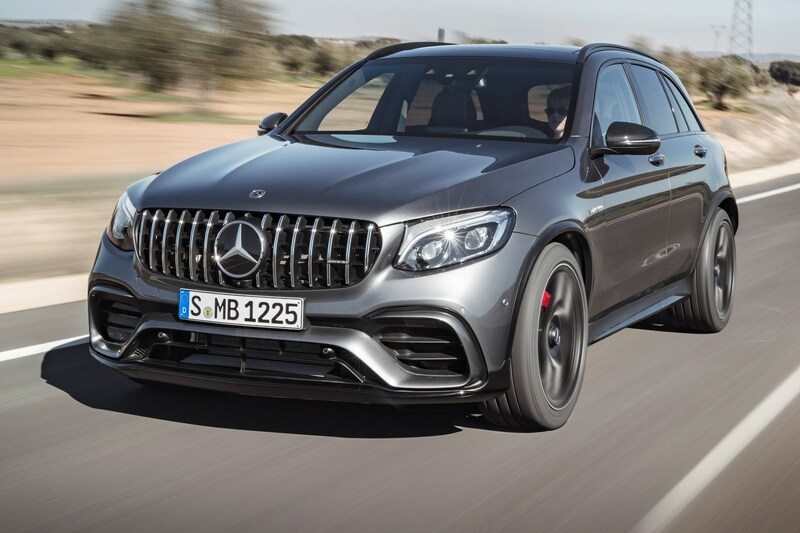 A hefty portion of the GLC 63’s innards come from the blistering E 63 saloon; namely the 4MATIC+ four-wheel drive system, sports-biased nine-speed automatic and the AMG Dynamic Select system. The 4MATIC+ four-wheel drive system is variable, so power can be shifted to either axle if it detects slip, and the new nine-speed transmission will happily make quick multiple downshifts if needed. Standard air suspension should help keep the 63 as level as possible around fast bends, too. If you opt for the S model, the drive mode has an additional Race setting, just in case you fancy thrashing your Affalterbach-fettled SUV for a quick time at the 'Ring. 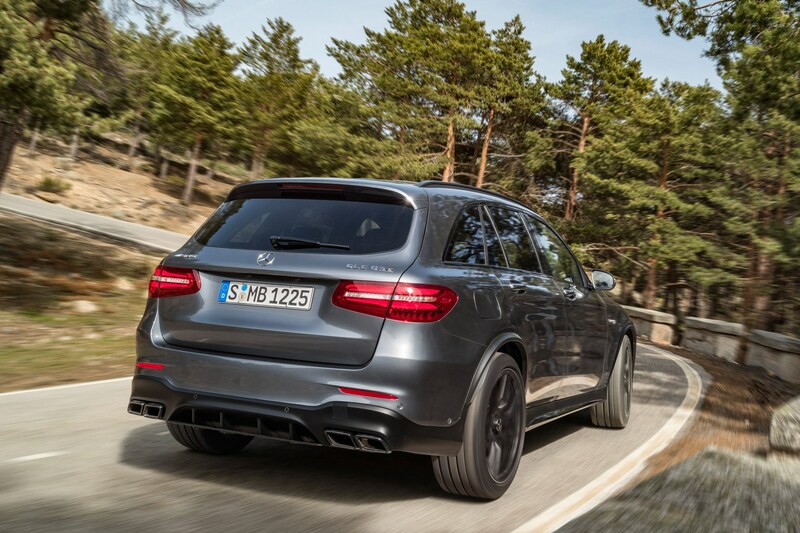 Like other AMG road cars, the GLC 63 can also be had with an optional adaptive exhaust system that regulates how loud that thunderous V8 barks; something that your neighbours will surely appreciate of a morning. If the V8 noise won’t make passers-by realise how serious your car is, its looks certainly will. In classic AMG form, the body is beefed up and four exhausts complement the rear bumper. Note the new use of AMG’s 'Panamericana' grille: it was something reserved for the range of AMG GT sports cars up until now. Inside, Merc’s ARTICO artificial leather is used on the seats in the standard GLC 63, while the punchier S has seats trimmed in Nappa leather. 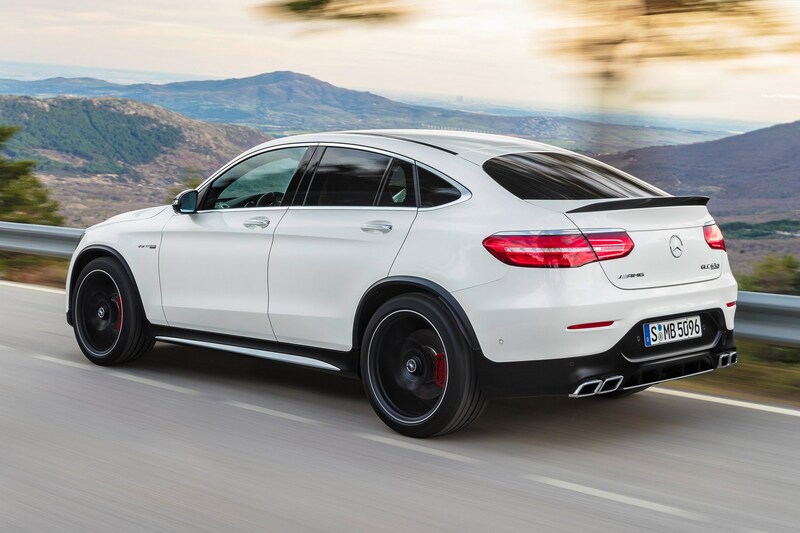 If practicality isn’t your thing, there’s also a GLC 63 Coupe version on offer (above). It’s given the full AMG treatment, just like its bigger-bottomed sibling and comes in both standard and S trims, too. 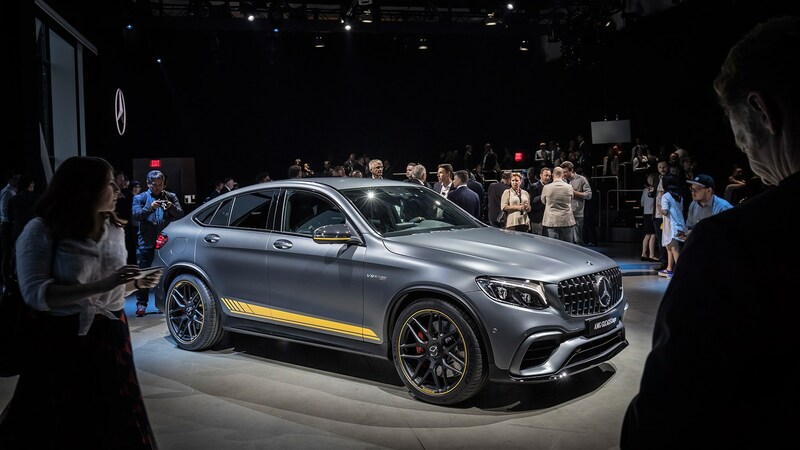 To top it all off, an Edition 1 flagship will be available at launch for a limited time, with grey or yellow detailing on the body and carbonfibre trim and yellow detailing inside. We've seen it in New York and can testify that it stands out in a crowd - though we suspect many target buyers will prefer to go decal-free. 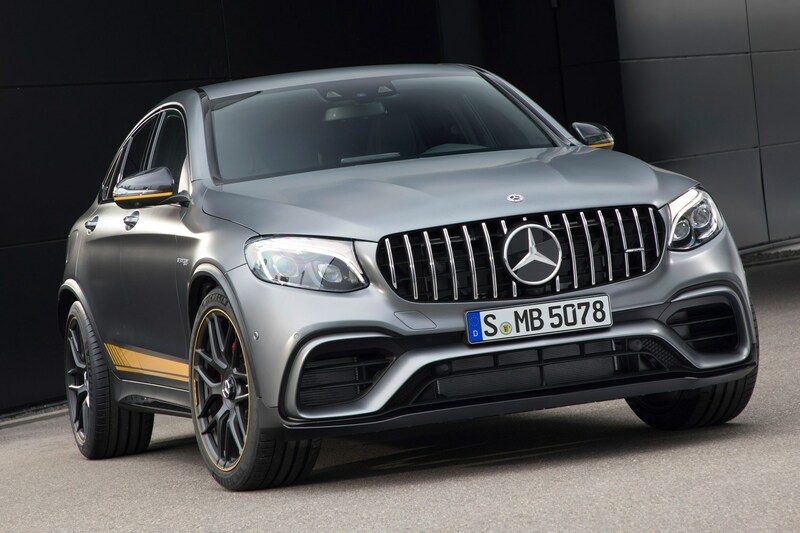 When can I buy the Mercedes-AMG GLC 63? 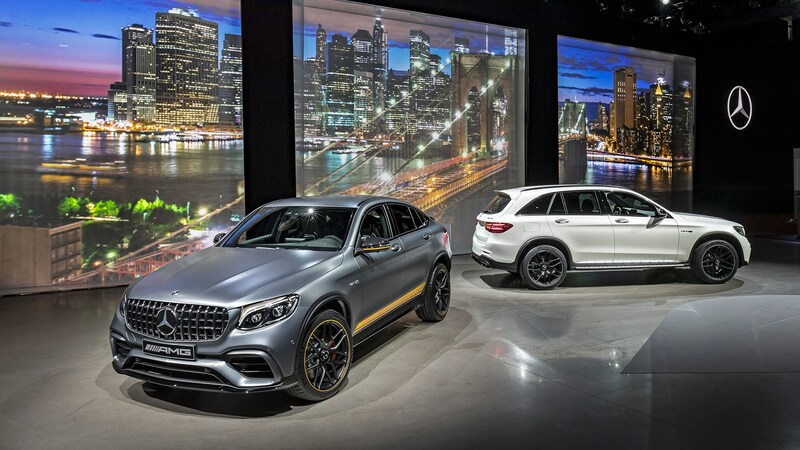 The new GLC 63 made its public debut on the eve of the 2017 New York Motor Show at a preview event in a photographic studio in the trendy Tribeca district, and is on sale now. If you're after a hot GLC the, er, 'basic' GLC 63 comes in priced at £68,920 with the more powerful S model starting at £75,670. If the Coupe version is more your flavour, you'll have to fork out either £71,410 or £78,160 for the S model. After the yellow pinstriped Edition 1 versions? Be prepared for a bill of at least £90,824.